I was employed as a lecturer in fabrication and welding at Guernsey college of FE from 14th February 2005 and was responsible for managing the workshop and delivering a range of engineering related programmes. During my first three years at the college I made a significant impact, both within the engineering programme area as a tutor and also across college in my role as the Internal Verifier for the A&V awards (now TAQA). I was appointed as the Programme Manager for Engineering in September 2008 and, together with my small team of staff, extended our portfolio of provision to deliver a wider range programmes for an increasingly diverse cohort of learners. Prior to taking up my position I was employed at Keighley College where I was responsible for managing the first national Centre of Vocational Excellence (CoVE) in fabrication and welding. This position involved a substantial role in achieving targets detailed in the CoVE’s three year development plan. This included the development of new learning materials, arranging for staff development and the dissemination of good practice. Additionally, my role as a part time City & Guilds Regional Lead Verifier (RLV) provided me with further experience of disseminating information and contributing towards the quality assurance system. My duties as an RLV were to manage twenty External Verifiers (EVs) covering the FE colleges and training centres throughout the North West of England. One of my proudest moments was when in 2002 I was awarded a City & Guilds Medal for Excellence in Teaching for Outstanding performance as a lecturer. In addition to education and technology my interest include; Ukrainian language, history and culture, Huddersfield Town football club and Morrissey. Having grown up in Guernsey, I left school and started an apprenticeship in the motor trade, attending the College of FE. After a 5 year apprenticeship I gained my B-Tech In motor Vehicle Engineering. I was in industry for around 20 years mainly as a technician, but also spending some time as service advisor, salesman and ending up as service manager for a Mitsubishi and Saab dealership. My career then came full circle and I joined the college staff in 2002 as a Technician for Motor Vehicle and Engineering Departments. I started to do some teaching and in 2006 I became a full time lecturer and also completed my Certificate of Further Education in that year. I thoroughly enjoy my job and feel really privileged to be able to give something back to the industry and see the apprentices that come through the college mature in to valued members of our Island community, providing a valuable service to the Island. Two years into the apprenticeship I joined the Royal Air Force and that’s where I stayed for twenty seven years. At first working with Air Sea Rescue and then moving on the workshop engineering, welding and assisting in the repair of military aircraft. This work sent to places I would never have gone to, meeting a variety of cultures; good and the not so good. I started teaching whilst in the RAF during the year 2000 at RAF ST Athan. I left the RAF in the September of 2006 and went to work in Amersham and Wycombe College an Electrical Installation Lecturer, part of my job there was the delivery of Key Skills across the construction department. After a short stint of being promoted to Head of School for Engineering and Construction and as a result of a college restructure I was delivering Functional Skills as well as Electrical Installation across the College. Early in 2013 I was promoted to Head of Department for English and maths. I arrived in Guernsey during the summer of 2013 going back to my roots, teaching Engineering. I am a qualified Yacht master Offshore have been on and lead many expeditions whilst serving in the RAF. My other interests are walking, cycling and new technologies. I am happy to be living and working in Guernsey and am looking forward to my remaining time on this wonderful Island. I joined Guernsey College of Further Education in September 2008 as a Mechanical / Manufacturing Engineering Lecturer responsible for the delivery of a range of engineering units / topics to learners from entry level to level three. Having just arrived from industry I was an influential member of the team in developing the workshop and updating the qualification units to match the industry needs. During 2012 I was successful in being appointed Programme Manager of the Foundation Learning provision. This was a 2 year posting that was subsequently extended for another year. In this role, I led a small team of Lecturers and Learning Support Assistants to support learners on a suitable level one programme of study. Key to the success of this role was flexibility of approach and remaining student centred at all times. I delivered Personal and Social Development (PSD) and Workskills units and trained to become Lead Internal Verifier for these qualifications. During this time I was fortunate enough to be asked to deliver some Independent Living classes within the Guernsey Prison. This has given me the opportunity to refine my teaching methods and experience an additional educational setting. September 2015 has seen me return to the Engineering department as Lecturer and join an expanding team of committed lecturers and technicians who are passionate about the learning outcomes of our engineering learners. I have also been able to continue with my teaching delivery at the prison. Prior to moving into Education, I had spent 25 years working in the manufacturing industry for a variety of businesses. I served my apprenticeship with British Rail Engineering in York, whilst continuing to study. Other roles have seen me working in South Africa in the marine business, fitting metallic insulation within nuclear power stations in Sweden and working as Quality Control Manager for a local electronics manufacturer. I bring a breadth of experience to the College that I hope, inspires and motivates the learners that I encounter. Away from work my interests are – Sailing, travel, DIY, dowsing, mindfulness/meditation and keep fit. I have been involved with the College for over 37 years. I attended as a Day Release Student whilst completing a diesel engineering apprenticeship at our local Power Station. After seven years, with what is now known as ”Guernsey Electricity” I took on the position of Chief Technician at the College. It was very much a different job in those days with none of the current IT systems controlling a lot of the work. A year later I gained a lecturing position in the Motor Vehicle and Engineering Departments. The rest is “history” as the saying goes. During my time at the College I have taught many City and Guilds apprentices in Motor Vehicle, Mechanical Engineering and Marine Engineering and BTEC full time students. The 30 or so years that I have been teaching has given me tremendous pleasure to see many of our “acorns” grow into “Great Oaks”. Some of them excelling within the companies they work for whilst other are running their own successful businesses. Many more have gone onto University to open up greater engineering opportunities. In the distant past, away from the College I used to Windsurf, winning the odd race here and there. Prince Charles actually used my board while being taught how to Windsurf by my brother, this is my claim to fame! Nowadays motor boating and sailing has taken place over standing on the water. I also like to play the drums and guitar and love travelling… in to the sunny climates! My full time primary role is to deliver the C&G 2357 to employed status electrotechnical apprentices as I am a qualified electrician. I have been working at the college for about fifteen years but prior to this I gained experience in both accountancy and engineering within the workplace. However I also help to the deliver the BTEC level 3 extended diploma in manufacturing engineering by teaching the essential “mathematics for Technician” unit. I am a full member of the Institute of Electrotehncial Technology (IET), a member of CIGPE and also hold a communication systems engineering degree: 2:1 B.Eng(Hons). It is great to be able help these full time students go on to university and deliver the type of mathematics which is directly related to the real world of engineering. I enjoy all types of sports but I am especially fond of motorsports. I started as a part time lecturer in September 2014 and deliver the Engineering Design unit of study to the full time BTEC level 3 students. I am a practicing freelance designer and owner First Principle Design. My company is focused on providing design and engineering services to the low volume automotive industry though projects are also regularly carried out in consumer product design and the marine industry. Building on ten years prior experience in the mainstream automotive engineering consultancy environment, First Principle Design has completed numerous projects in the automotive, consumer product and marine fields. Customers have included Zenos Cars, Caterham Cars, SDR Sportscars, Tiger Sports Cars and Atlantis Marine as well as numerous private clients. From initial vehicle architecture definition, through styling concept generation, to detail engineering design and production of manufacturing drawings and data, First Principle Design can support a broad range of needs. Additionally I am engineering director and partner in Protected Transport Systems a specialist business that focuses on designing and producing the Levaton range of products providing innovative loading systems for ISO containers. After leaving the old Boys Grammar school with A-levels I chickened out of university and started work in the finance industry. Three months in to the job and I knew I’d made a mistake. I always loved tinkering around with anything mechanical and so secured an apprenticeship with Ruette Braye Motors coming to this College of FE to gain my City and Guilds Technician qualifications. I specialized in Jaguar, Rover and LandRover vehicles. In 2000 I move on to work for the Guernsey Police as a Vehicle Examiner obtaining my Advance Traffic Patrol qualification at Hendon Police College. In 2006 I moved full circle coming back to my roots as a Motor Vehicle and Engineering Technician. I really like working at the CofFE it is full of people I enjoy working with. It now feels good to pass on the skills that I learnt and the experience that I gained from years in the industry to the apprentices passing through today. When I left school my overriding wish was to become a craftsman in engineering using machining techniques. When I left school in 1970 I was an apprentice at Mollart Engineering in Surbiton, a firm with a keen interest in training its staff to a very good standard. I trained for 4 years in all aspects of machining and hand skills. I left them in 1976 to move to Guernsey for the summer. I worked in refrigeration for a year but moved back into local engineering at Marine and General Engineers on the Bridge. This was a fantastic place for me as we served Condor Hydrofoil fleet first and if any technical problems occurred we went ASAP to keep the fleet at sea. It was great way to learning new skills and in that time I trained many apprentices. I eventually became the workshop supervisor. 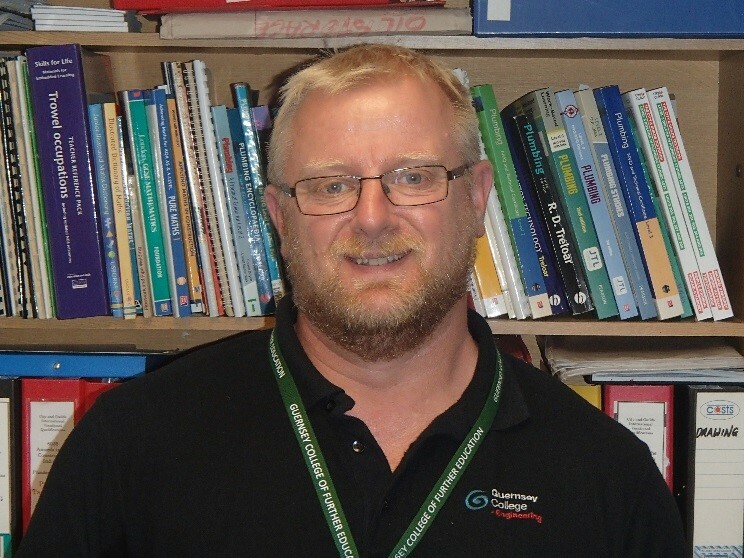 After being made redundant I tried a variety of roles but eventually came to GCFE were I am now responsible for the Welding and General engineering workshops and I also help out students by supporting them with their machining techniques. I am a keen ornithologist and the Regional Representative for the Bailiwick for the British Trust for Ornithology (BTO). I am now several years into my training as a bird ringer. I also have a role as part of the Bailiwick Seabird monitoring team.